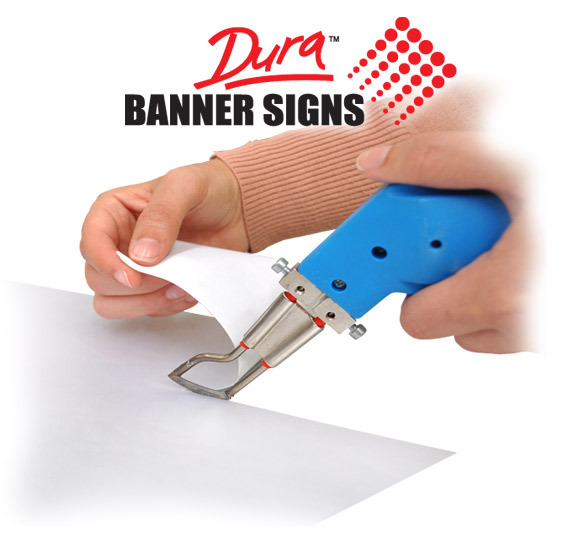 The hot knife technique is a preferred system for trimming fabrics and banners because it prevents edge fray. It offers a cleaner custom cut and straighter result and assists finishing and fitting options. Page Link | See How others are using this product here. Skin-Eyes: May cause irritation, burns, laserations and damage. The hot knife is HOT 300°C±. Exposure Guidelines: Protect against hazards such as contact. Eyewear: Safety glasses during processing. Inhalation: Do not inhale smoke, fumes or vapors while using any heated unit. Respiratory: An approved respirator should be worn. Ventilation: Thermal processing requires ventialtion of fumes and vapors which may cause irritation to the nose and throat. Heat warning: Do not touch. Contact with thermal unit will cause burns, laserations & disfigurement. Wear appropriate burn prevention gloves and clothing. Turn off unit when not in use. For hand held units do not enable the trigger ON longer than 15 seconds without releasing trigger to OFF. All operators are required to pass induction and training tests prior to any use. Unauthorized use prohibited. Cooling Period: Beware-Units may take 5-10 minutes to cool. Install work-exclusion zone barriers to protect employees whilst units cool down. Turn units off between use.